I'm improvising a little, though. I made the sleeves a bit longer than the pattern, and did some ribbed cuffs. 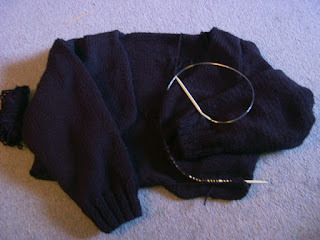 I knitted a similar jacket last year, and really like the frill edge on that one, so I'm adding the same to this one. You can see me picking up stitches here. You immediately double the stitches by making one in every stitch, and then knit 6 rows. I'm not sure what to do for a fastener, though. A button, some kind of tie, or something else. Any ideas? The pattern says "With right side facing and crochet hook, attach yarn at front marker; ch 31, sc in 2nd ch from hook and in each ch across, sl st in same place as joining. Fasten off. Rep on opposite front"
Trouble is, I have no idea what this means. I may have to visit Mum, as she's been re-learning crochet and will understand, I'm sure. I love the color of this, Peahen. I don't know the first thing about crocheting, though. I will be no help there. I think you need to model this one when it's done. I assume you mean the colour of the one on the pattern, as mine is black! It was difficult to photograph because most of the time it just looked like a sillhouette! I certainly will model it - it's pretty much done now other than the fastening, which I'm still musing about! HA. On my monitor, it looks like a lovely plum. Black is nice though--sophisticated. Does it need fastening?